A post to the Facebook page of AMC's 'Talking Dead' sparked outrage following the San Bernardino attack. LOS ANGELES -- A post to a popular television show's social media has sparked anger among some after the terrorist attack in San Bernardino. The picture of a bloody sheet with the caption "Office holiday party look, anyone?" was posted to the Facebook page of the "Talking Dead," which is a talk show that follows the AMC hit show "The Walking Dead." The post, which appeared at about 2 p.m. on Sunday, comes less than two weeks after the San Bernardino terrorist attack on Dec. 2. During the attack, Syed Farook, 28, and his wife Tashfeen Malik, 29, entered the Inland Regional Center where a holiday party was being hosted for the San Bernardino County Department of Health and began opening fire. Farook and Malik killed 14 people while injuring 22 others. The couple was killed hours later in a gun battle with law enforcement just miles from the IRC. Officials are investigating the attack as an act of terrorism and the FBI recently concluded a search of Seccombe Lake Park in connection with the mass shooting. 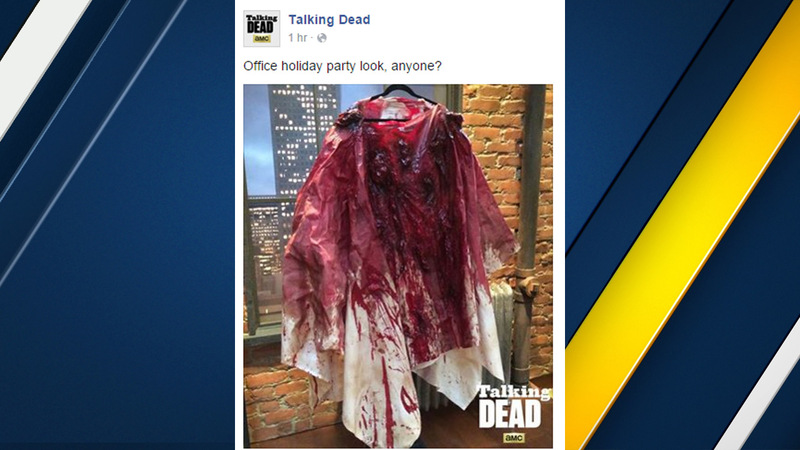 The picture on the "Talking Dead" social media pages appeared to be a prop used during "The Walking Dead" mid-season finale and showed a white sheet covered in blood. Some commenters on Facebook believed the post was in bad taste following the San Bernardino attack. "After the massacre at the San Bernardino office party a few weeks back, that's in really poor taste," Chesley White wrote. "Usually you can do no wrong, but my immediate thought on seeing this was San Bernardino....not cool," Liz Lucier posted. Janica Trusky wrote, "I'm a fan of the show but the timing for this post is in poor taste... Please consider removing." ABC7 has reached out to AMC for comment and has not yet heard back. We'll add a response when we hear back from the network. UPDATE: The posts were removed from the Facebook and Twitter pages of the "Talking Dead" at about 7:40 p.m. In tweets, Chris Hardwick, host of "Talking Dead" stated he was "furious" about the post and his producer was "appalled." @carmitch I have no idea but I'm furious about it. I don't have access to the account. We're trying to get ahold of the company who runs it. @hevin111 I don't have access to that account or I would take it down myself. I called our producer who was appalled. He's working on it.